Event comics are often maligned because of their meta-perspective, giving us the overlay of events happening across an entire line. Some can be really good, such as how the recently concluded X-Men: Battle of the Atom was in its first month, or how Throne of Atlantis and Trinity War were. But some can be… bad, such as Infinity because the event comics don’t really give you a consistent story to follow. Or characters for that matter. Geoff Johns has had more experience with event comics than most writers today given all the work he did for Green Lantern in its pre-New 52 days, and so he’s often a dependable guy for such comics. Sadly, he seems to be missing the mark again and again with Forever Evil, the main 7-issue event mini-series specifically. In two issues thus far he’s given a lot of different perspectives to advance the main storyline, setting up the various tie-in comics for the event, or even drawing on them to further the main storyline. Its a “feeding off each other” effect that isn’t really working for me. And the art is mediocre at best. Currently there are four ongoing tie-ins to Forever Evil: there’s Matt Kindt’s ARGUS, Peter J. Tomasi’s Arkham War, Brian Buccellato’s Rogues Rebellion, and the multi-author Blight which takes place in the regular comics. Geoff set up a lot of these storylines back in the pages of Forever Evil #1 in September, and the other writers have taken that issue as the jump-off point for their own mini-series. 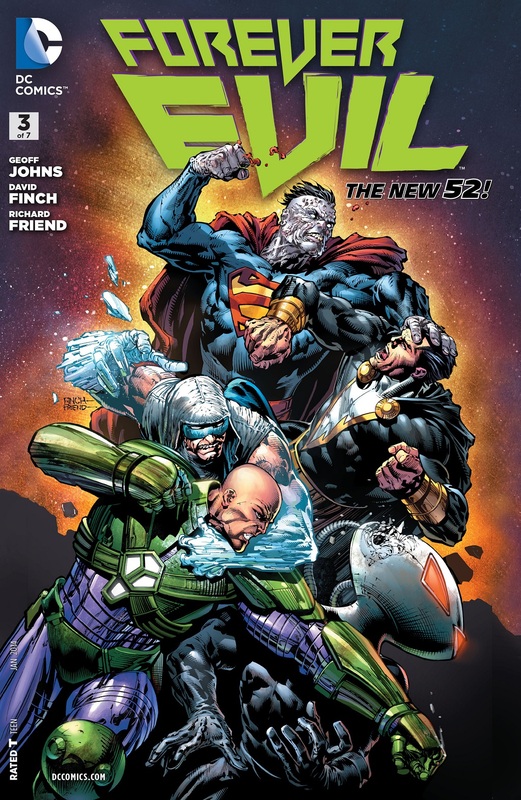 Its an interesting move certainly, but it becomes frustrating when the main event comic deals with some of those events further down, as Forever Evil #3 does. The biggest turnoff for me here was that we get to see the continuation of the great cliffhanger from Brian’s Rogues Rebellion #1 in this issue. It felt really odd and it didn’t feel like it had much of an impact. It was an “over and done with” kind of thing and it has kind of ruined Rogues Rebellion #2 for me since I was expecting this continuation to take place in that, not here. Now I have no idea what is going to happen in that issue since I don’t read the solicit texts. And besides, with an entire issue to deal with, I expected Brian to handle it much better, even though what Geoff did here isn’t so bad. It just feels out of place. Then there’s the continuation of the Justice League #24 cliffhanger, which I expected to see resolved in Justice League #25, certainly not here. Now I don’t know what’s going to happen in that issue either. Of course, Geoff is writing both books and thus he can do whatever he want with these plot threads, but once again, its about the whole thing feeling out of place. What it boils down to is the fact that all this doesn’t leave much room for the other stories, such as the return of certain characters from the dead in Forever Evil #2 or what many of the non-aligned villains are doing. That is, villains like Warp and Cheetah and the others who we haven’t seen yet. We get some moments with Lex Luthor and patient B-Zero and they are interesting in terms of what Lex is trying to accomplish, and what he ends up doing later, but since there are very few pages to handle that entire interaction, it all feels a little off. What was nice however was to find out how the aforementioned “resurrected” characters survived the attack of the Crime Syndicate in Justice League #23 in August. We are finally starting to get some answers, even though a lot of it is still up in the air. But I liked it. Especially in terms of the brief look at one of the greatest thieves in the world. True to character, it was a really good moment, and its nice to see that even with just a handful of panels, Geoff can work his magic. Generally, the story was good, but it seemed to be stuck in the “team assembling” mode. There are four more issues to go after this, so I’m hoping that the comics really up the pace sometime soon. That’d be welcome. In terms of the art, it was a bit better than last time, even though some inconsistencies were still there. Such as how Weather Wizard appears to lose his beard and get it back in the space of three panels. Or how Captain Cold is drawn. Or the somewhat exaggerated physical look for Lex himself. Among others. David Finch’s art was slightly better this time around, but it didn’t help all that much since the story wasn’t all that good. I think Finch could do a much better job if he was drawing a straight set of characters from issue to issue rather than jumping back and forth so much. The big throw-down between Ultraman and Black Adam looks really good, and so does the throwdown between the Rogues and the duo of Firestorm and Power Ring, but that is balanced by the rather disappointing final page with the “team”. Sonia Oback’s colours and Richard Friend’s inks were fairly decent, once again, just the book needs to lose a little bit of its dark and shadowy look. That is holding back the art from being much better. Also, that cover is entirely bonkers. That is not how things happen in the issue at all, not that this is a new thing. Its a trend that I see often and I realize it makes for a great cover, but it just ends up being disappointing when the story doesn’t match. Overall, it was decent, but not great. Which is nothing new from how the previous two issues have been. More Forever Evil: #1, #2. Posted on November 6, 2013, in Comics Reviews, Review Central and tagged Bizarro, Black Adam, Black Manta, Comics, Comics Reviews, Crime Syndicate of America, David Finch, DC Comics, DC Universe, Event Comics, Forever Evil, Geoff Johns, Lex Luthor, New 52, Review, Review Central, Richard Friend, Science Fiction, Sonia Oback, Superheroes, Supervillains, The Rogues, Trinity War. Bookmark the permalink. 10 Comments.